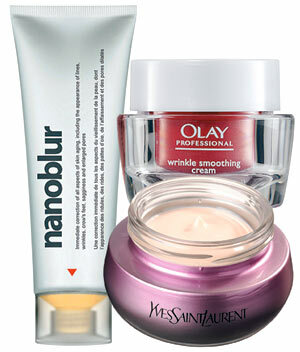 The science behind anti-ageing creams is increasingly becoming fact rather than fiction. As consumers, we’ve been sceptical for years about how much anti-ageing the beauty world can really deliver. As beauty merges more with science, however, that outlook is due for a shake-up. Proctor & Gamble has already used atomic force microscopes, a technology used by Nasa, to observe molecular changes in hair after different ingredients in shampoo are applied to it, and a similar scientific revolution is now happening with anti-ageing skin products. For generations it was enough to smooth the skin with varying combinations of glycerine, witch hazel and lanolin, but not any more. Today’s affluent consumers are prepared to spend money on high-tech skincare — provided they are offered proper evidence that such products work. This requirement is being met with a variety of formulas developed from an ever-growing body of research into the mechanisms of skin ageing. And there is, at last, evidence that these products do make a measurable difference. It is the only way to keep consumers investing £100 a month on skincare — and for big companies to keep a revenue stream that allows a huge investment in research. For example, L’Oréal invests £545m a year in 3,400 scientists working in 18 research centres across the world. It is this investment that led to the development of Forever Youth Liberator, launched by Yves Saint Laurent Beauty (owned by L’Oréal). The product, which has been developed in conjunction with molecular biologists from the Max Planck Institute in Berlin, contains synthetic versions of three naturally occurring glycans or sugar molecules found on cell surfaces that are involved in transmitting regeneration messages. L’Oréal has commissioned independent research on the discovery from other academic dermatologists, who have published studies in scientific journals showing how the compound improves skin elasticity and thickness. This is only the first of this year’s new advances, and the race is on to introduce other science-based lotions. Sales of women’s facial skincare products in Britain are expected to generate about £1 billion this year. Despite the recession, the market-research company Mintel estimates that 90% of women use some kind of moisturiser and sales are growing at 4% a year. And after the horror stories about leaking breast implants and unregulated facial fillers, it is expected that the skincare market will grow. Evidence that new products really do have a demonstrable impact will undoubtedly encourage sceptical consumers, who would have invested in facelifts or fillers, to spend more on creams. And researchers are also harnessing technology developed for other scientific purposes in the search for ever more sophisticated skin rejuvenators. Fujifilm, which has diversified into health and beauty following the demise of the 35mm camera-film market, has used its knowledge of collagen and antioxidants to create a novel anti-ageing product. Collagen, the main protein in human skin, was also a component of photographic film, and antioxidants, which help to protect the skin against the ageing effect of UV radiation from the sun, were used to produce sunlight-resistant film. Later this year, Fujifilm is launching a range of products under the brand name Astalift, based on astaxanthin, an antioxidant derived from algae and seaweed. The benefits of astaxanthin are backed by more than seven years of research, and Astalift has already been successful in Japan and the Far East since it launched there four years ago. The company says it has “big hopes” for it here. Nanotechnology, a breakthrough science that has improved drug delivery by targeting cells with increased precision, has emerged in cosmetics, because scientists have discovered that the light-diffusing properties of nanoparticles are capable of creating a wrinkle-free optical illusion. 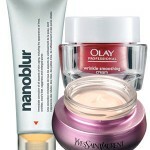 The latest innovation is Nanoblur, launched last October, which uses this nanotechnology literally to blur wrinkles, a piece of trickery that, according to the manufacturer, instantly makes users look 10 years younger. Meanwhile, Unilever has published research showing the nature of the link between high blood sugar, obesity and premature skin-wrinkling, and is looking at ways to block this process. Last year Proctor & Gamble published independent clinical trials that favourably compared its new Olay Professional Antiwrinkle Kit with retinoic acid, a vitamin A derivative that was previously the only really effective antiwrinkle agent, but one that had the unfortunate side effect of causing skin-thinning. Even Boots, which drew plaudits from independent scientists for the efficacy of its Protect& Perfect serum, launched in 2007, is now engaged in a top-secret research project with scientists at the University of Manchester to develop a successor anti-ageing product. That is, if another brand doesn’t capture a big share of the market first. Shiseido’s forthcoming Bio-Revitalising Complex claims to stimulate the efficacy of oxytalan fibres, which create plumpness and elasticity in the skin. And then there is idebenone, contained in Elizabeth Arden’s Prevage range. This is a potent antioxidant developed from research into the coenzyme Q10. There is no question that idebenone has a biological effect. Researchers at Newcastle University announced last year that it appeared capable of regenerating cells in the retina, producing a remarkable effect in patients with a rare type of hereditary sight loss. L’Oréal, not to be outdone, is preparing to publish a variety of reports in scientific journals, explaining its latest research, showing more under­standing of the role of glycobiology in skin cells; how exposure to UV light damages gene expression in skin cells; and the effect of a compound developed from research on jasmonic acid, which stimulates cell repair and is the principal ingredient in the recently launched Lancôme Visionnaire. Don’t be blinded by science talk, however. Even if a product arrives surrounded by a baffling advertising vocabulary of amino acids and peptides and references to clinical trials, it is all meaningless unless the results have been reviewed by independent dermatologists and published in a scientific journal for the sceptical scrutiny of other specialists. Véronique Bataille, a research dermatologist who is involved in skin studies at the department of twin research at St Thomas’s hospital in London, pointed out that, until recently, it has been difficult to prove the effect of anti-ageing creams without taking a facial skin biopsy, which would be disfiguring and unethical. 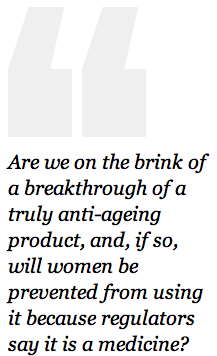 So, are we on the brink of a breakthrough of a truly anti-ageing product, and, if so, will women be prevented from using it because regulators say it is a medicine? Julie McManus, director of science and regulatory affairs at L’Oréal, says yes to the first question and no to the second. “Medicines are for ill health. Our products are designed to work on existing pathways in healthy skin that may not work as effectively any more because of the effects of ageing,” she says.